"What type of pepper are you wear-....urm...snorting..?" It was an obscene phone call so well cloaked; so incredibly subtly executed, that I didn’t even know I was into it until it was way too late. It was a Saturday morning, full of the usual hub-bub and rushing around that weekends usually bring, and we were on our way out of the house when the phone rang. It was a rep from an ad agency who was casting a radio spot for a cold and flu remedy, and he was on the prowl for a voice actress who could convincingly voice a spot sounding like she had an actual, real cold. No problem! This is what I do! I proposed that he send me the script over the weekend, and I’d be happy to record a demo in my studio first thing Monday morning. Nope — that wouldn’t work: time was of the essence and he needed it right away. Not at all unusual for broadcast jobs. Instead of recording it, he asked me to just demonstrate over the phone right then and there that I could do it (red flag number one), and when I asked if he could send the script for the commercial via e-mail, he refused (red flag number two) — he just told me to grab whatever copy I had handy and just read from that. I located a script for a job I had done earlier that week and started reading it in what I thought sounded like a very believable, stuffed-up, sniffly fashion. He explained that there’s a “cliche”, cartoon-y, “I can’t brede I’m sooo sdufffed up…” characterization, and he wanted to avoid that — he needed that distinct sound of a woman with actual, inflamed sinuses. The client’s very picky, he went on to explain — and the client hated everyone they’ve auditioned so far because they were giving him that “fake cold” sound. I really focus, and give him another take, which — in my estimation — sounded exactly like I do when I actually have a cold. Again — it’s just not working for him. Then, he asked a curious question. Urm….certainly. I am an inquisitive cook who has been influenced by every cooking magazine and blog out there to acquire each and every exotic, multi-colored breed of peppercorn on the market. My pantry practically groans with every variety of available pepper. What the Hell does that have to do with voicing the spot? What……oh HELL NO…..
And the Third Red Flag’s a Charm! I hung up as fast as I could. Apart from telling my husband about it, I actually didn’t tell any other voice talent about it, until about a year later, when I read on a message board about the same thing happening to another female voice talent. Turned on by women who have colds? I’m not sure if that’s even in the DSM IV (soon to be V) catalogue of psychiatric disorders, but if it isn’t, it sure should be. And rather than trolling around doctor’s offices or working for a pharmaceutical company running test groups for Sudafed, he decided to mine voice talent, who might be considered somewhat expert at sounding any way they’re asked to sound. His payoff would obviously be finding someone willing to “play” and indulge his predilection — and judging by my brief, split-second thought of travelling a few steps to the kitchen and actually reaching for a pepper grinder — others may not have had similar filters in place, and indulged him. Not the usual heavy breathing “what are you wearing?”-type of obscene telephone caller, but it still made me think about the nature of obscene phone calls — and whether or not they would go the way of the buggy whip now that we have the entire world wide web to indulge the stuffed-up sinus devotees, or any other wide variety of arcane turn-ons which used to occupy phone lines and force women into listing their home numbers with only first initials “A”, “J” or “D”, for example. With caller ID, instant traceability like *69 (which will call back the last incoming number), and call blocking features, one would think that the risk would be higher than the “payoff” and that our ability to float — featureless — in the ether of the internet — would all but eliminate the need for phone prowlers. There’s a transparency now that was previously unheard of. 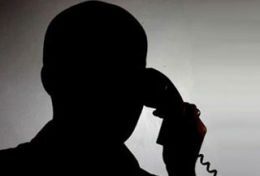 Phone tracing used to be time-consuming, expensive and used only in rare cases of kidnapping or treason. It’s now completely turn-key. But let’s not forget what that “payoff” of the obscene call actually is, and the basis behind the admonitions from telecom companies to their customers for decades: it’s the startled, shocked, extreme reaction from the recipient of the call which delivers the goods for the obscene caller. It’s that real-time shock and surprise in the voice of the victim on the other end which is at the heart of the calls — an immediate and often highly charged response is what they’re after, and reason why a soft (non emphatic) hang-up is always recommended. A strong, even volatile reply in the form of a return e-mail cannot carry the same emotional weight as a real-time register of shock and disgust. Are there fewer obscene calls now than there were twenty or thirty years ago? Stats are surprisingly hard to unearth; I did find a quote from a Pacific Bell rep who vouched for the instance of general harassment calls to “go in spurts” and that the trend in so-called “crank” calls (along the lines of Prince-Albert-in-a-Can pranks) still escalating around school break times. As to the instance of obscene calls falling as a direct result of other, more cloaked means of communication — we can only guess. My take on it is that the gratification achieved by the obscene phone caller can never be replaced with keystrokes, and that the relative ease with which callers — whether it be from landlines or cellular networks — can be tracked and pinpointed, only adds to the risk and danger — and m ay heighten the conquest. Obscene messages have even become a growing phenomenon on Skype, with a cloaked protection of forwarded numbers and shared ID’s making the “messager”‘s identity difficult to trace. I, for one, am thrilled that my exposure to a “phonoerotic” was limited to that one surreal Saturday morning, and I’m happy to report that my peppercorns are safe snd secure in the pantry, where they belong. Join me here for my next article — in about two week’s time — when I delve into whether or not the casual, relaxed — even lazy — preference in IVR prompts is helping or hurting us.